Shea Rose won a Boston Music Award as R&B/soul/urban contemporary artist of the year. Her “Little Warrior’’ mix tape consists of hip-hop, rock, and funk. It took some coaxing before Shea Rose was ready to let her “little warrior’’ come out for the world to see. Anyone who saw the Braintree-born singer’s bold performance at the Boston Music Awards in November, where she picked up the trophy for R&B/soul/urban contemporary artist of the year, probably wouldn’t have guessed as much. That night she lit up the room with a striking combination of raw energy and polished musicianship, leading her band as they fearlessly bounded through the myriad of hip-hop, rock, and funk influences that colored her 2011 mix tape “Little Warrior.’’ It was a memorable moment of arrival for a promising young talent whose path to success - despite passing through the Berklee College of Music - has been anything but predestined. Shea Rose (left, with fellow contestant Nancia Music) at a recent “Community Auditions’’ performance. Her talent for creative writing eventually led to translating her poems into songs, but early efforts at singing with a band of Berklee-based musicians left her frustrated by the gap between their technical skills and her more instinctual approach, and she decided to enroll in 2007, the final year in which applications did not require an accompanying audition. Entering into an elite music school as a virtual novice, she found the adjustment period trying. 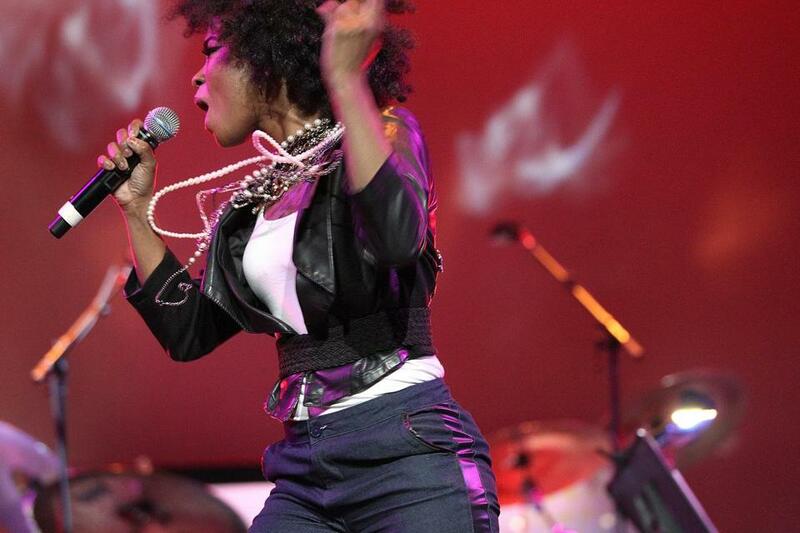 The voice that emerged from Berklee experience can be heard on “Little Warrior,’’ a hip-hop-inflected collection of songs that capture Rose’s developing dynamic sound on tracks like the brash “I’m the S***’’ (co-written with her brother) and the thrashing guitars of “Power (Rockstars and Posers).’’ On the funky stomp of “Jungle Fever,’’ she even shows an aggressive sexual edge (“Mr. DHL, fine as hell, I wonder if he’s packing more than the mail,’’ she quips). Yet her musical persona strikes a significant contrast from her otherwise quiet demeanor; beneath the warrior, a more sensitive soul exists. My Angel Wears an Afro, Rose’s social outreach project, is part of her way of engaging with people outside of music through volunteer initiatives within underserved communities. Saturday’s concert, a fund-raiser for the Human Rights Coalition, an LGBT civil rights organization, falls in line with those efforts. More shows, including her first headlining gig in Boston at Cafe 939 next month, and more challenges beckon, but despite blossoming late, Shea Rose is now on the fast track to success. Martín Caballero can be reached at caballeroglobe@gmail.com. Follow him on Twitter at @_el_caballero.